Earlier this year, we finally potty trained the Little Dude. He’d already turned 3 and we’d talked about doing it about 8 months sooner, but life got in the way. After a whirlwind weekend of rushing him to the bathroom every 10 minutes, he quickly got the hang of things and was eager to move on to his next stage of life: wearing Big Boy Underpants. I was ready, too. As his brother had arrived a few months earlier, buying diapers for two was not ideal. And when he refused to wear even a nighttime diaper on the second night of potty training, I praised his independence, even as I feared for his sheets. But my son didn’t let me down, and his sheets have happily stayed dry every night since. The Little Dude was under the impression that toilet paper is something to use as a way of hiding the evidence, before it’s flushed away. Truth be told, after trying TP on him a few times, I gave up. It never quite did the job it should have. So on one trip to the store, we picked up a packet of Cottonelle Flushable Wipes. I didn’t know such a thing existed. I also didn’t know that regular wipes weren’t flushable, but I learned that the hard way. I theorized that if “baby wipes” had worked on him to that point, why stop just because he was a “big boy” now? Then I figured if he’s a big boy and he could use wipes, perhaps I should also explore the option, as a bigger boy with bigger, um, needs. Needless to say, I was thrilled to recently discover an extremely logical system for bathroom cleanliness issues: the Cottonelle Care Routine. Simply put, the CCR says that you should first wipe with dry toilet paper and then have a second level of cleaning with their wet wipes. It’s like how you wash your car with soap before you go over it a second time with a coat of wax. Doubling up leads to a far shinier end product. The Cottonelle Care Routine, when executed correctly, also leads to a far shinier end product. And a cleaner feeling. So what do you have to do? 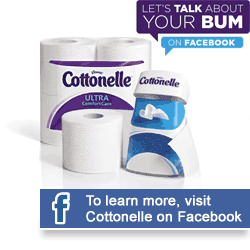 You’re going to put on your thinking caps and come up with some Haiku, yes Haiku, about how Cottonelle Flushable Wipes and the CCR do things like change the way you think about cleaning yourself, your bathroom habits and other formerly taboo subjects. Let’s keep it clean, but make them funny, witty, clever, punny and full of entendre. You are going to post those Haiku, with the hashtags #LetsTalkBums and #Haiku on Twitter, but you can also share them on Instagram, Facebook and all the other places you already hang out while pretending to check your email at work. At its most simple, a haiku is a 17-syllable poem separated into three lines; the first and third lines comprise five syllables each, and the second has seven. In order to differentiate these lines, you can either add a line space (using your Enter key), or a “/” at the end of lines 1 and 2. So what can you win? Well, each week a panel of experts (me and a half dozen other Dudes) will select the best #LetsTalkBums Haiku Tweet and its Tweeter will win a $200 Amazon gift card. Not bad, right? At the end of the contest, one of the 7 weekly winners will be chosen at random to win the Grand Prize of an all expenses paid trip to the Dad 2.0 Conference in New Orleans January 30-February 1st, 2014. That’s right, airfare, hotel and a conference pass to hang out with some amazing people, and yours truly, can be yours for thinking of 17 clever syllables. Make me and your 10th grade English teacher proud and Tweet away. There’s also going to be a Twitter Party on Monday, September 30, 2013 from 8:00-9:00pm EST hosted by the inimitable @whithonea where they’ll be giving away an iPad Mini and some $50 Amazon gift cards. What do you have to lose? Let’s talk bums, and have fun doing so. Full contest rules are at wipingpoetic.com. I've always wondered why regular wipies aren't flushable too. I've used these with my toddler as well and they work fantastically!